Hope you all had a great 4th of July last week! Despite the intense heat we’ve had in New York, we’re loving being in the middle of summer at the farm, where everything is lush and green and growing so fast we can barely keep up with it. Including our vegetable garden! Last year Henry built two beds for a veggie garden, but after a long winter of renovating the house, we took the lazy route: we threw a bunch of seeds into the beds and hoped for the best. This year we added more beds, moved them to a sunnier spot, ordered seeds from High Mowing Organic Seeds in Vermont, and planted strategically. Last summer (our first) at the farm was rainy and temperate. Not this summer! It’s been dry and very hot - in the 90s these last couple weeks. Fortunately, our neighbor who rotates the cows and feeds the chickens on week days has been watering them when we’re away. And despite all the deer and rabbits in the area, so far we haven’t had any issues with animals nibbling. We planted seedlings of tomatoes, red and orange bell peppers, jalapeños, and eggplant, as well as seeds of arugula, spinach, radishes, zucchinis, two other kinds of squash, cucumbers, lettuces, and herbs. It’s so exciting to come back every weekend and see how they’re flourishing! All the plants are looking really strong and healthy, but most aren’t ready to harvest quite yet. The exception is the arugula. We planted a whole bed of arugula plants early in the summer, weeks before the heat wave hit. Since it thrives in cold weather, it grew like crazy. 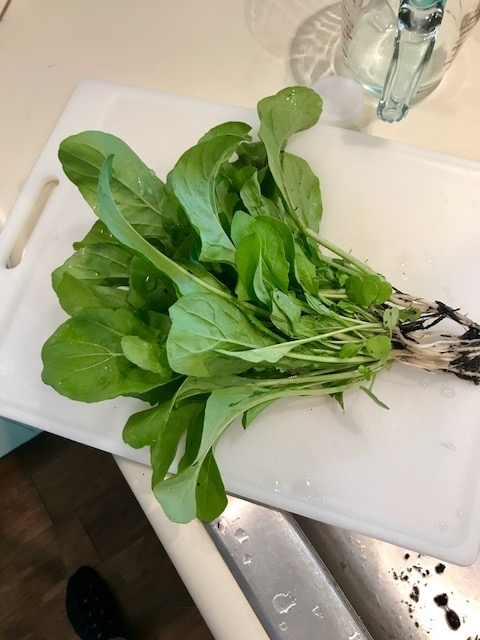 We’ve had so much fresh arugula! We’ve been eating a ton of it in our salads and sandwiches, but last weekend we had to figure out what to do with the surplus so it wouldn’t go bad. So we made arugula pesto. Blend everything except the lemon juice in a Vitamix or other blender until it's smooth, then fold the lemon juice through. Makes enough for a 16-ounce mason jar. Enjoy! We’ll be sharing more recipes soon as we harvest more veggies, so stay tuned.